This was my first ever attempt at making gnocchi. I mean, they are little potato dumplings, how hard can they possibly be? So, with a newfound confidence instilled by a recent and very successful first attempt at making pasta, I set to work and quickly found my answer - they are easy as pie! As with pasta making, it is not so much complex as just a little drawn out in process. Luckily, these don't take quite as long so you can have them ready to go within the hour. The inspiration behind this was the beautiful summer squash I'd received in my Abel & Cole box (clearly doing its job on the inspiration front!) and, at a slight loss for anything better to do with it, I decided to roast it and serve it with gnocchi. I could have turned it into a risotto, but that felt too much like a cop out! I wanted to keep it as simple as possible, so little more than sage and parmesan seemed like the perfect solution. The squash itself is really easy to prepare - being summer squash, it is thin-skinned so you can easily peel it using a potato peeler so once you've done that all you need to do is split it in two and remove the seeds. To make the gnocchi, boil the new potatoes whole with their skin on for 20 minutes or so - until cooked but still firm. If the potato is too soft you'll have soggy gnocchi! Let the potatoes cool enough so you can handle them, then peel off the skin. Then, using a potato ricer or mouli, crush the potatoes into a large mixing bowl and add the flour. Knead like bread for 15 minutes or so until you have something with a similar consistency to Play Doh. Now, working with a quarter of the dough at a time, roll it out on a floury surface using your hands until you have a long snake about 1.5cm in diameter. Cut it into 2cm pieces and then press the sides of each piece with the tines of a fork. 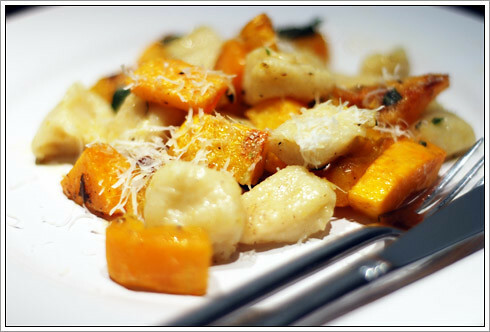 This creates texture on the gnocchi and gives any sauce used something to stick to. Transfer each piece to a flour-coated plate and when you're done, cover with a tea towel. The gnocchi will keep for an hour or so before cooking. Preheat the oven to 180°C , then peel and deseed the squash. Cut into 3cm square chunks then place in a roasting dish and coat with a little olive oil. Season with salt and pepper then roast in the oven for around 30 minutes, until soft. When the squash is about 10 minutes off being ready, bring some lightly salted water to the boil for the gnocchi and remove the sage leaves from their stems. Fry the sage with the butter until crisp, then set aside until ready. Grate the parmesan, then in batches, transfer the gnocchi to the boiling water. Cook for 2-3 minutes until they float to the surface. Carefully drain, then transfer back to the pan with the squash and the sage. Mix the ingredients together gently - the gnocchi are quite fragile - and transfer to plates, sprinkling a little parmesan on each Plate. Enjoy!